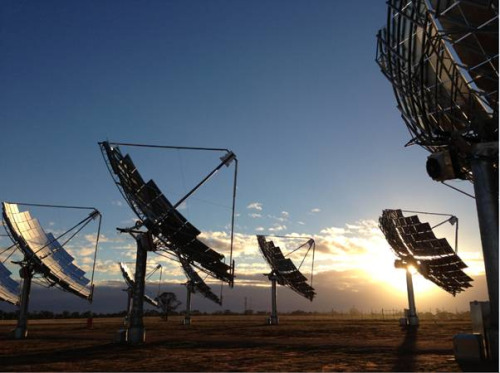 The completed Mildura Dense Array CPV Demonstration Facility, June 2013. In Australia and New Zealand, solar photovoltaic (PV) market trends indicate burgeoning demand owing to strong governmental commitment to the promotion of solar energy and creation of sustainable cities – By Frost & Sullivan. The solar CPV plant, located in northwestern Victoria, Australia, is now connected to the national grid and providing enough electricity – under a power purchase agreement, signed with Diamond Energy in 2012 – to power up to 500 average-sized homes while removing 4,200 tonnes of CO2 emissions per year. The Mildura facility currently has 40 individual dishes and is a demonstration plant designed to establish, over extended operational periods, that Solar Systems’ Dense Array concentrated photovoltaic (CPV) dish technology can reliably and cost effectively produce electricity – in order to validate the technology’s cost-effectiveness before proceeding with larger scale plants. Plans to expand the Mildura facility to 100 MW, featuring around 2,000 dishes and providing peak power output sufficient for up to 40,000 homes, are also underway. Construction is expected to begin in late 2014, subject to successful operation of the 1.5MW facility and finalisation of financial prerequisites. Once built, the 100MW Mildura Solar Facility is expected to be the largest solar plant in Australia and one of the largest solar CPV plants in the world. Solar Systems is a specialist in utility-scale solar power technology, and a subsidiary of Silex Systems. Dr Goldsworthy added that investment in utility-scale solar power stations was growing rapidly as the technology improved. Global installations of utility-scale (10 MW and over) solar facilities have now exceeded 14 GW (or 14,000 MW), with over 4 GW of capacity installed in 2012– up from less than 1GW in 2009. This represents an annual global market of approximately US$15 billion with strong growth set to continue for the next two decades. Solar Systems company is also investigating other major project opportunities in the 10 to 50 MW range in Australia and offshore markets, including the Middle East and the USA. The construction of a 1 MW demonstration facility in Nofa, Saudi Arabia, is expected to be completed later in 2013.